Supercharger, dam of 2010 Kentucky Derby winner Super Saver, has a 2011 Tiznow colt born on March 30, at WinStar Farm near Versailles, Ky. The mare has been bred to Medaglia d’Oro. 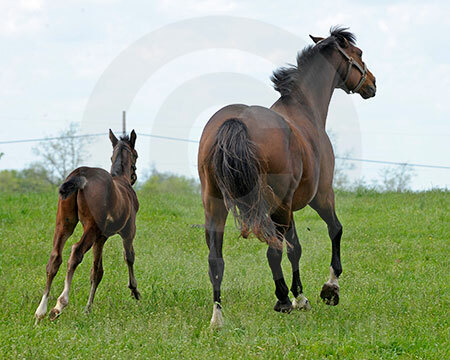 With her current foal, Supercharger walks to her field. Order this Photo. Taking off for a run. Order this Photo. Enjoying some time in the field with fellow mares and foals. Order this Photo. Super Saver, by Maria’s Mon, is finishing his first season as a stallion at WinStar. He will have his first crop of foals in 2012. Brethren, Supercharger’s 2008 foal by Distorted Humor, was impressive as a stakes winner earlier this year on the Derby trail when he won the Sam F. Davis Stakes at Tampa. After an 11th place finish in the Arkansas Derby, Brethren was returned to Kentucky for a rest and training at the WinStar training facility. Stardom Bound had her first foal on April 18, 2011 at Katsumi Yoshida’s Northern Farm in Hokkaido, Japan. The grey colt is by champion Big Brown, who won the Kentucky Derby and stands at Three Chimneys Farm near Midway, Ky. A Northern Farm representative said Stardom Bound is doing well as a first-time mother! Rags to Riches has a 2011 Galileo colt in Ireland and has been bred back to Galileo. Her first foal, an unnamed 2-year-old filly by Giant’s Causeway, now is with JJ Pletcher at his Payton Training Center in Ocala, Florida. The filly likely will move into training at the track with Todd Pletcher in July or August of this year. Playa Maya had a Broken Vow colt on Feb. 1, 2011, at Ashford Stud near Versailles, Ky. The dam of champion 2-year-old Uncle Mo, Playa Maya is back in foal to Indian Charlie. Uncle Mo will be one of the favorites at the Kentucky Derby on Saturday, May 7. Uncle Mo prepares for Kentucky Derby 137 at Churchill Downs. Order this Photo. We will have lots of Kentucky Oaks and Kentucky Derby photos available after the race at The Blood-Horse Photo Store. Be sure to check them out. 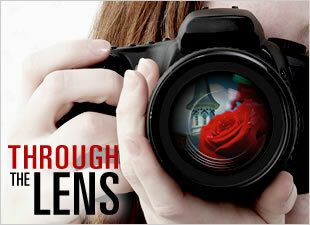 Our photographers will be out at the track working hard. Also, I will post some of my favorite images to my Facebook Fan Page, so be sure you are following. I am once again looking for suggestions for broodmare's you would like for me to pay a visit to or get updates on.....so let me know in the comments below. (Note: You must now register an account on BloodHorse.com in order to leave comments.) Thanks everybody and best of luck this weekend.